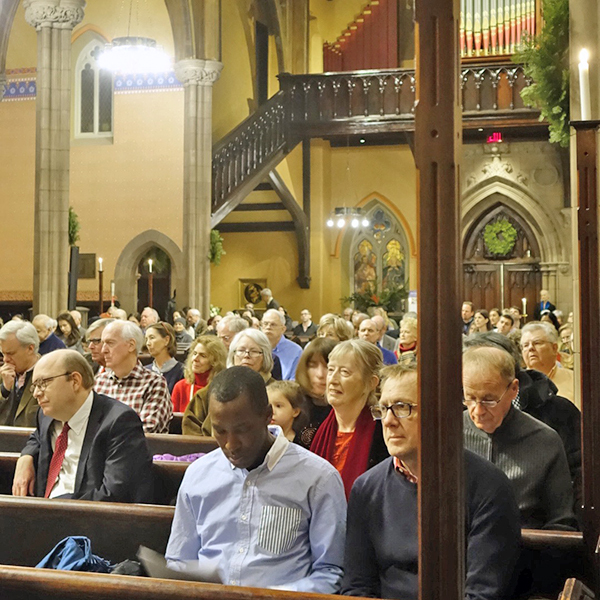 Grace Church is a worshipping community that stands firmly upon the foundation of the Episcopal faith tradition, with its reliance on the guidance of Holy Scripture and its acceptance of well-reasoned interpretation of the Gospel of Jesus Christ. Grace Church recognizes, appreciates and welcomes the full inclusion of all people. If you are new to us, please complete one of the Welcome cards found in each pew or at the back of the church* and stay with us after the service for Coffee Hour (in the Guild Hall most of the year, Choir Room during the summer). Please consider signing up for eGrace Notes, our weekly email news bulletin delivered right to your inbox. 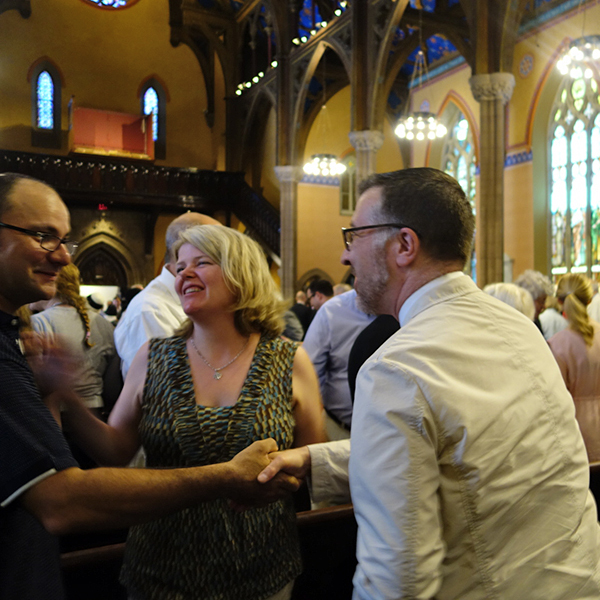 Then join us at one of our twice-yearly Newcomers Gatherings, where you can become acquainted with the clergy, parish leadership and other parishioners. *in the rear of Guild Hall during summer months. Here is useful information that will help you find your way around the church and Parish Hall. The Welcome Table found at the back of the church* holds complimentary materials about Grace Church and our Episcopal / Anglican tradition. It also holds a book through which you may request Intercessory Prayers, as well as sign-up sheets for special events. *in the rear of the Guild Hall during summer months. Name Tags help us greet each other with confidence. Temporary tags are available for our visitors and guests on the Welcome Table. If you would like a permanent magnetic name tag, please provide your information on the Contact Grace form. Opposite the Welcome Table is a table with items to help entertain small children while they worship with the grown-ups. Look for simple worship bulletins with illustrations for coloring, crayons and picture books. Grace offers professional childcare for infants and toddlers on Sunday morning from 9:00 am to 12:30 pm. The Nursery is located in the Colonial Room, across from the kitchen. Each child must be registered by an adult, and parents or guardians must remain on church grounds when their child is in the Nursery. Children are welcome at Communion. 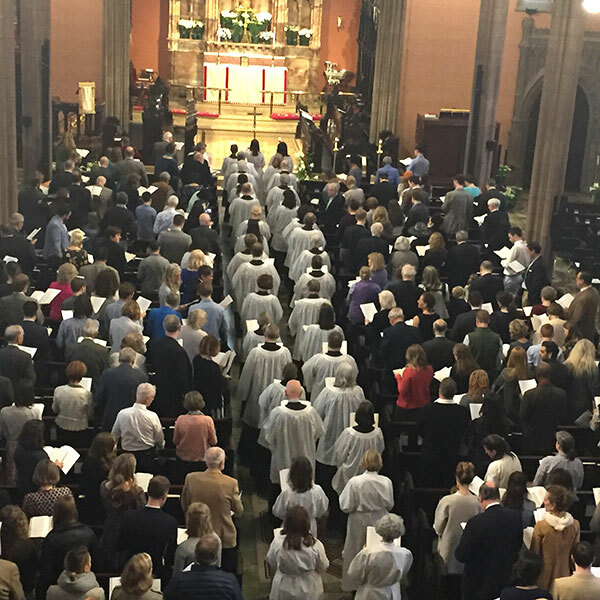 We suggest that you collect your child from the Nursery during the Offertory (right after announcements are made) if you would like them to join you. The Men’s Room is located at the bottom of the stairs, down from the Hicks Street courtyard entrance. The Women’s Room is up the stairs from the Hicks Street courtyard entrance, down the hall and to the right, after you pass the kitchen. There is an ADA accessible restroom on the Grace Court side of the church sanctuary, to the left of entry from the wheelchair ramp. Please ask an usher to direct you. The church nave is easily accessible via the Grace Court entrance for those using wheelchairs or other assistive devices. A chairlift is available in the stairwell near the Hicks Street courtyard entrance for navigation among the various levels of the church and Parish House, including the Gym and the Guild Hall. Please ask an usher or a sexton for assistance. Hearing assistance devices are available from the ushers, except during the summer months. Grace Church is located at 254 Hicks Street (between Joralemon Street and Grace Court), Brooklyn, NY 11201. Entrances are on Hicks Street and on Grace Court. The Grace Court entrance is wheelchair accessible. Grace Church is reached easily by public transportation. The 2, 3, 4 and 5 trains stop at Borough Hall. The R stops at Court Street. The A, C and F stop at Jay Street-Borough Hall. Several downtown Brooklyn bus lines also stop nearby. From Borough Hall, walk west (towards the river) on Joralemon Street and turn right on Hicks Street. The Google Maps webpage or app can provide a map and driving directions to the church from any point. If you are driving, please be aware that street parking in Brooklyn Heights can be challenging. However, complimentary parking is available at the 44 State Street Garage (at the end of Willow Place) during service times on Sundays and holy days. Please bring the garage ticket to an usher for validation.